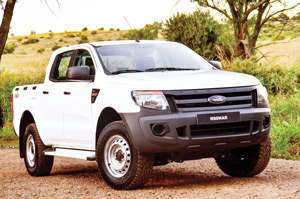 A new variant of the popular Ford Ranger bakkies has been announced last week. The first rugged Ranger XL Plus arrives in dealer showrooms early next year. Pretoria – Ford Southern Africa last week unveiled a rugged new version of its popular Ranger bakkies for Sub Saharan Africa. The new variant, the Ranger XL-Plus, becomes available at dealers early next year. At the launch Ford said it brings a new dimension of toughness to the line-up, making it of particular interest to mining companies, farmers and other business owners with very specific requirements. Built at the Silverton Assembly Plant in Pretoria, following a US$1.8 million investment, Ranger XL-Plus will be sold in South Africa as well as being exported to other markets with similar requirements. It will be available in both Left Hand Drive and Right Hand Drive. External modifications and enhancements include a frame tested for an increased towing load of 3500kg, extruded aluminium side steps, front mud flaps, and a lockable fuel filler cap. Inside and under the skin, the Ranger XL-Plus gains a Crew Chief mounting bracket paired to an expanded wiring harness for accommodating more switches and circuits, a heavy duty second battery, vinyl floor covering, and heavy duty seat covers. By January next year, the Ranger XL-Plus will be available to customers in Sub Saharan Africa in three body styles with two chassis cab models in single and double-cab variations, and a double cab model with a loadbox. Drive comes from the Duratorq 2.2-litre TDCi engine mated to a six-speed manual gearbox. All models have four-wheel drive and are fitted with an Electronic Locking Rear Differential.